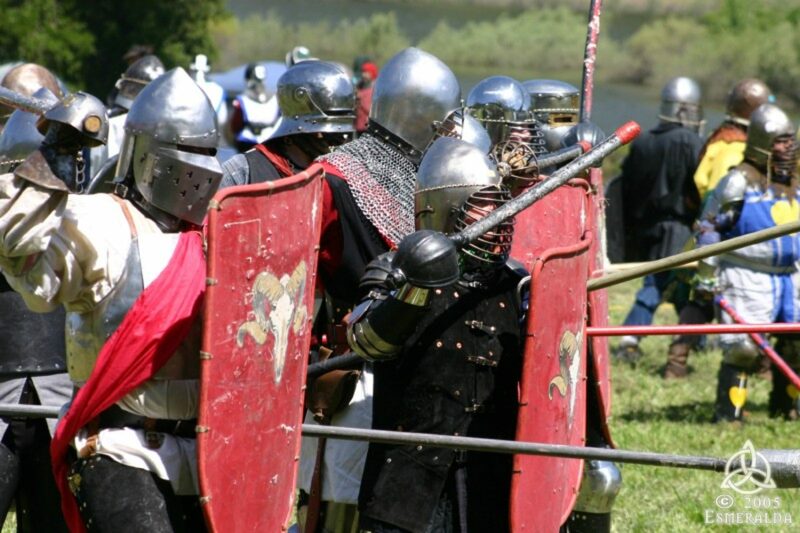 The Society for Creative Anachronism, Inc. (SCA), is an international non-profit volunteer educational organization devoted to the research and re-creation of pre-seventeenth century skills, arts, combat, and culture by employing knowledge of history to enrich the lives of participants through events, demonstrations, and other educational presentations and activities. At our events, members strive to recapture the ambiance of the Middle Ages and the Renaissance. This requires research into such topics as clothing, weaponry, armor, food, music, and innumerable other arts and crafts. We then attempt to practice and teach what we have learned as authentically as possible, by constructing reproductions of medieval artifacts, practicing the arts and crafts we have researched, learning to fight with a sword and shield, and so on. The SCA began with a small backyard tournament in Berkeley in 1966. It was incorporated in California in 1968 and has grown steadily to a membership of approximately 30,000 paid members, with an estimated figure of perhaps double that number who participate without formal membership. Members can be found in the United States, Canada, Europe, the Middle East and Far East, South Africa, Australia, and New Zealand. You can find out more about the Society for Creative Anachronism on our webpage, www.sca.org.